Whilst Race@SPR has been busily losing all possible time to The Beverley and ToMR, a few of our current (and non-uniformed) SPR crew have flown to Victoria, raced, swept podiums and returned home. 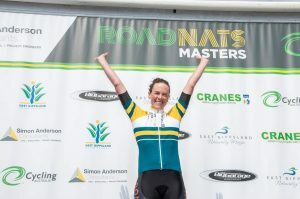 SPR and Dome clad, Sam Flockhart, Amanda Nabi and Michelle McLintock took some barnstorming results at the Masters Nationals Road Race events, including ITT, Road Race and Criterium disciplines. 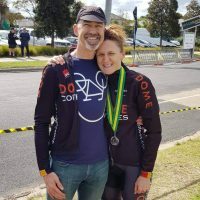 Amanda did what Amanda does most weeks, Sam – after quietly and diligently training whilst still FIFO-ing for work – took a Bronze in the ITT, and McLintock ………. 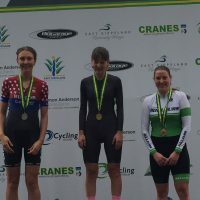 Michelle has done a lot of work for team mates, but this particular weekend nabbed a 4th in Crit, 2nd in Road Race and GOLD in the ITT, winning the Overall Champions prize for age group. 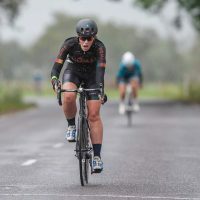 Here’s a report from one of the SPR Hitters – we present Sam Flockhart. Back in March I was looking at the Cycling calendar and trying to decide what events to target for the year. I figured I needed a goal that would keep me fit throughout the winter without succumbing to the cold and rain. 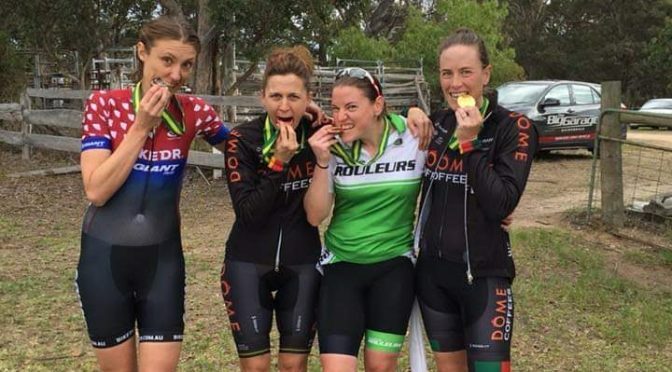 I saw the 2018 Masters Nationals were being held in East Gippsland, Victoria this year, with a 16km TT on an undulating course in Metung, 76km Road Race in Swan Reach and a Criterium in Paynesville. I thought, why not, something to aim for but a 3-week holiday in July to Italy without bikes or bike training didn’t seem like such a great idea in the lead up to Masters, as I would only have 10 weeks to get back in shape. This coupled with a heavy work schedules and studying, (all due within about 2 weeks of Masters) meant the pressure was on. 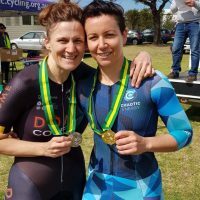 Time was against me and it meant a lot of hard work to get to race fitness. But not one to shy away from a challenge, I thought, what the heck. Nothing ventured, nothing gained. The TT was held in Metung (about 3 hours drive east of Melbourne), with an undulating 16km out and back course. Being my first TT at a National level, to say the nerves were at a premium was an understatement. The sight of familiar faces (SPR and Perth crews) put my mind at easy and the ‘hug of Ballam’ was a welcome comfort and was enough to settle me and get ready for action. Warm up complete, it was off to the start line for bike and helmet checks before entering the marshalling area. Women’s 1 were off first and seeing Amanda Nabi take off down the ramp made things real. I was off at 12:21 and just a minute behind chasing me was former SPR member, Sarah Fitton. Called up to the start line there was nothing left to do but give it everything, roll down the start ramp and put 16kms behind me. The excitement of the countdown got the better of me as I took off down the ramp, past the SPR crew and the Nascent crew who were all cheering words of encouragement as I went past, (although I have no idea what they were saying!!!). The first climb appeared and that settled me in to a rhythm and pace I knew I could hold. There were 2 climbs on the way out to the turn around point and my aim was just to get up them and to the turn around without being caught by the Fitton Train. A bonus would be to close in on the rider in front of me. As I was 1km from the approaching turn-around, I could see an official car on the course and knew the rider in front of me was just up the road. The rider in front of me entered the U-turn just in front of me and I was able to pass her on the return leg. I could see Fitton approaching fast as I came out of the turn for the return journey, knowing the 1 min gap had shrunk slightly, but I still had a decent gap and I just had to hold it. The return journey was certainly faster than the first 8kms and this was evident by seeing another rider (who started 2 mins in front of me), just up the road. This was incentive to push a bit harder and see what I could do. The kms were ticking down and I could see the finish banner come in to view. The seconds were ticking by and when I crossed the line I had no idea of my official time or my placing. I rolled to the end of the road and tried to regain my breath, (without much success) before I rolled back to the start to see the results. I looked up to see my coach and SPR crew approaching with big smiles on their faces. The words I heard next were “You’re in 3rd place at the moment”. I didn’t rejoice at that moment, knowing the results weren’t finalised and not knowing how many more riders in my age category were still out on course. 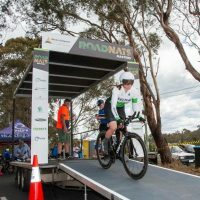 Then the confirmation came, “Sam Flockhart from the South Perth Cycling Club in 3rd place”. Nailed it. Numerous hugs, smiles and high 5’s were shared before heading up to the podium. 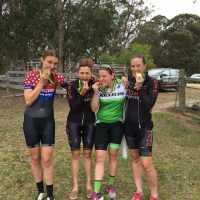 The best part of the day was getting to share the podium with past and present SPR members, Michelle McLintock, Amanda Nabi and Sarah Fitton, (who grabbed 2nd place in our Women’s 2 age category). 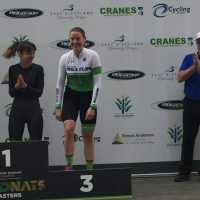 With the number of Masters categories, the Road Race was run over 2 separate days, Friday and Saturday. SPR Member Vanessa Johnson was up for the Road Race on Friday and got to enjoy lovely weather. The sun was shining, and the birds were chirping. Unfortunately, this was not the case on Saturday when Michelle, Amanda, Olesya, Teneal and Myself lined up for the 76km road race. Whilst it started overcast, the rain soon came and set in for the day. The race started with a neutral zone before we were given the go. The pace was steady with a peloton of approx. 25 riders completed the first lap. 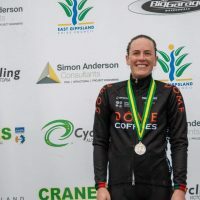 There were a few short sharp attacks over the next 3 laps of the undulated course, with only 1 rider getting away- Justine Burrows the winner of Women’s 2 who finished a whopping 8min 30 secs in front of the peloton. A crash mid race separated the bunch a bit with 3 riders coming down, the SPR crew unscathed and continued in the bunch. From the back of the pack I managed to go around the outside and get back on the bunch. Last lap commenced with a ding of the bell and it was on. Pace picked up and try as I might, I found myself out the back door and wondering how I was going to get back on. The commissaire came passed and gave me the thumbs up before following the peloton – still in view, but felt like I was on an elastic band yo-yoing back to them. The pace came off on the last climb of the lap, so I gritted my teeth and put out some massive watts to get on the back of the pack, again. We were all together heading to the final climb that was 2-3kms from the line. The pack was a bit jumpy as everyone was looking at each other to see who was going to make the first move. The base of the climb fast approaching, the peloton split again as Amanda, Teneal and Michelle took off. The climb seemed to never end, but alas we made it to the finish in 1 piece. I finished 1 min behind the front of the peloton – a good effort considering an average day weather wise. 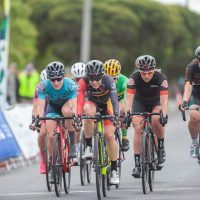 Sunday, we moved to Paynseville and there was certainly plenty of pain dished out that day in the Criterium races. Morning session saw Tim Hopkins line up in the Men’s Masters 3 for his 40 min crit. Tim rode well and ended up being caught by the fast lapping peloton after approx. 20 mins. The afternoon session again saw the SPR women line up for our 40min crit. There was a lot of jostling for position early in the race with the pace being something I was unable to hold. I settled in to a rhythm and aimed to stay in the race just as long as I could. I saw 2 riders ahead of me and caught them before trying to work with them to stay away from the fast chasing peloton. There were various groups of Perth Peeps dotted around the course and their encouragement each lap really kept me going and aiming for that next lap. At the 25 min mark, I was caught, and race done for me. Watching the finish from the side lines I was nervous for the SPR crew. Bell lap done, and it was on. A rider from Dubbo jumped to the lead out of the last corner with Amanda and Teneal chasing hard. Michelle chased and came across the line mid pack, to secure the Champion of Champions jersey for the weekend in the Women’s 1 category. The smiles on the faces of all riders summed up the relief that a good weekend of racing was all done. To anyone wondering whether they should sign up for next year National Masters Championships, Absolutely you should!!! 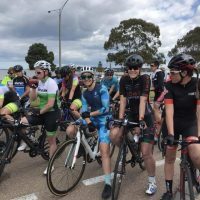 You may surprise yourself and the racing experience you receive racing with people from over Australia, some who race a bucket load more than you, is invaluable. Sign up, start training and pin a number on, cos it’s worth it.